WIKI: Tromeo and Juliet is a 1996 independent transgressive comedy film adaptation of William Shakespeare's Romeo & Juliet from Troma Entertainment. The film was directed by Lloyd Kaufman and co-directed by James Gunn, who also wrote the film's screenplay. The film is more or less a faithful adaptation of the play except with the addition of extreme amounts of Troma-esque sexuality and violence. 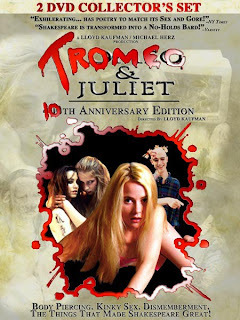 The title of the film is a portmanteau of "Troma" and "Romeo & Juliet".